The model in our figure work shop last Monday held this pose for ten minutes. That limited time suffices to get the figure down but does not allow for any “atmospherics” like the enveloping black frame. That was added later in my own studio, without the model, because the drawing needed it, I felt, for compositional reasons. A few days later, today, I was still not happy with the way the eye moved through the composition and I decided to use this drawing in this blog to illustrate how ameliorating certain lines can greatly help the eye move through the page. I happen to like that in a drawing; I don’t want the eye to get stuck on a passage or be blocked by some very insistent line. To illustrate what I mean, I’m showing the same drawing here, with certain contour lines lightened, not much, but just enough so that as you follow the line it will at times become lighter or even disappear. To be specific about where the line was picked up, here’s a copy of the final drawing with numbers where I did the work. 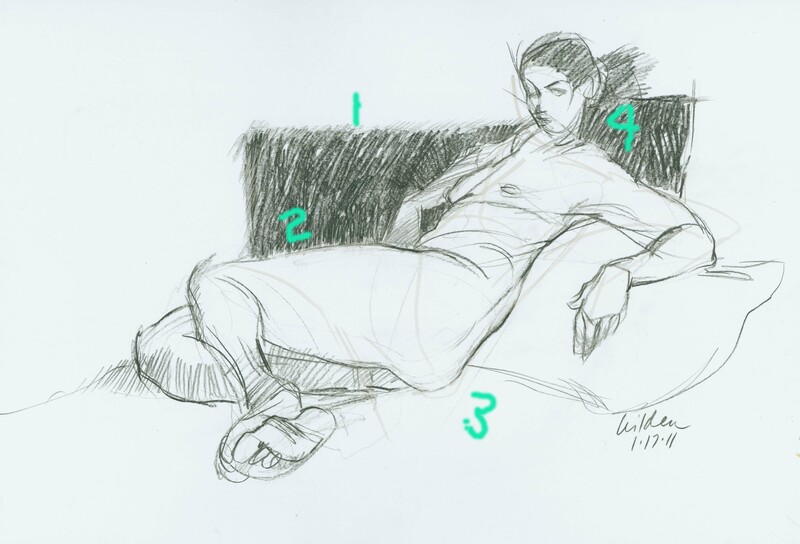 Notice that the anatomy remains clearly stated, we lose nothing of the contour, when it is indicated by the black of the background pushing against the figure (#2 and #4) or when the line is so pale as to be almost lost, as in #3. The line at #1 had to go because it was too severe and demanding of attention. It’s continuation at the upper right corner behind the head, however is another matter, a topic for a future post, which will involve Cézanne. These changes still did not resolve the problems I saw with the drawing. It kept reminding me of Ingre’s Grand Odalisque, one of his more ridiculous exaggerations of the female anatomy. He sacrificed anatomy and credibility on the altar of composition, we can see that: what he was after here was a smooth upward curve like a cup. The reclining figure thus becomes a vessel, a popular metaphor for a woman’s body in the 19th century. She is in effect, a reclining version of his La Source, another kitschy male fantasy of the female body. (We must get to a discussion of kitsch one of these days!) Here, then, is the final-final version of this figure study. If you’ve followed the above with any interest, you’ll see how the earlier problems are resolved by the final subtle changes. Jean Arp (1886-1966) was a French-German artist. Art historians classify him under surrealism. “Sur real” in French means above- the-real, or hyper- real. When you’re seeing things as more deeply, more profoundly connected than is conventionally allowed, you can say that your perception is hyper-real, or surreal. For example, if I say that branch is connected to the trunk of the tree, I’m making a conventional observation, yawn. Even saying that SAT scores are connected to college policies is a conventional observation. But if I go to a rummage sale and see an umbrella and a sewing machine next to one another on a table, which happens to be ( I notice) an operating table, and I feel that these things are intimately connected, then I’m having a surreal moment. The umbrella and the sewing machine, presumably were placed on that table without deliberate planning by any apron wearing rummage sale organizer. The placement occurred simply by chance. Ah, the surreal sensibility says, did you say chance? How wonderful! Chance is a powerful, profound, inspiring force that operates in our lives every minute, every day. The next time you hear somebody say, “ohmygod that’s like totally weird,” you can remind yourself that the word “weird” originally meant “fate.” When the weird sisters in Shakespeare’s Macbeth are stirring their steaming cauldron, they are cooking up fate. They are the fate sisters, literally. But what is fate, other than another word for chance. Therefore, that tattooed art student’s “like totally weird” is really a comment about how something just happen because of chance. 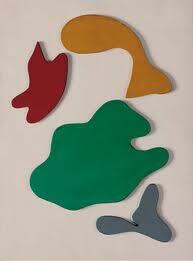 So……back to Jean Arp. He embraced the element of chance in his working process. For example, he would stand at his work table in his studio, place a sheet of white paper on the table and drop snippets of (perhaps color) paper onto that white sheet. Where they fell, he would glue them down. Sometimes he added the step of carving the paper shapes out of wood. And he declared the result a work of art. And it was, and is. He created it in harmony with this force called chance. This acceptance of chance occurrence in the art process is a major part of the modern sensibility. 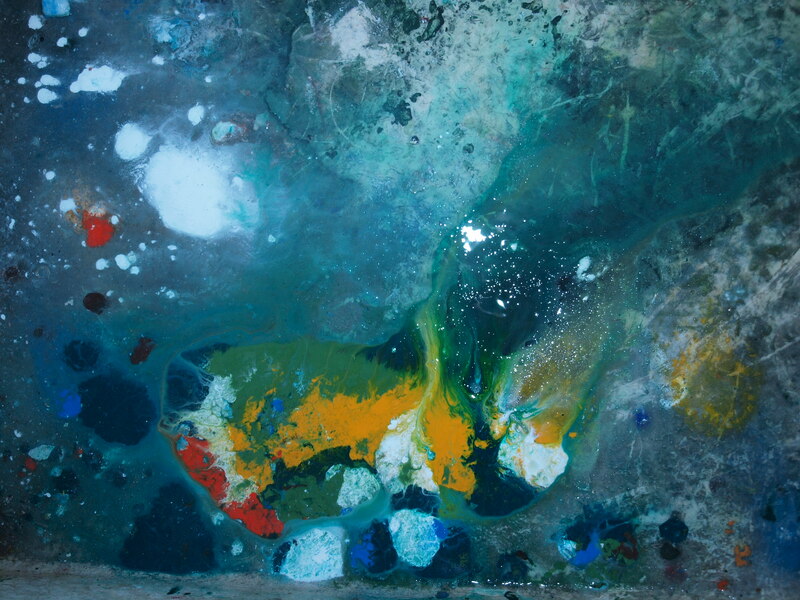 Today at the end of my landscape painting class I washed my hands in the classroom/studio sink. This is a sink where everybody rinses brushes and pallets and generally dumps stuff. It consists of two squares one of which is hopelessly black. But it so happens that the other half got scrubbed to its original white a couple of weeks ago and had newer paint splatters. As I washed my hands I looked down into that square bottom. This is what I saw. I dare say, I had a surreal moment. And so did one of the students, Danielle G., who documented this sight with her excellent camera. 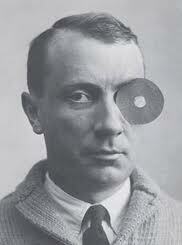 One more insight into Jean Arp’s mind. In 1915 he was summoned to sign up for the draft for what became the slaughter called World War I. He took the paperwork he had been given and, in the first blank, wrote the date. He then wrote the date in every other space as well, then drew a line beneath them and carefully added them up. He then took off all his clothes and went to hand in his paperwork. He was told to go home.